Since 1990, the James Beard Foundation has put on an annual awards show that, in more ways than one, stands as the food and drink industry’s version of the Academy Awards. Every spring, the James Beard Foundation Awards (JBFA) recognizes outstanding American restaurateurs, chefs, food journalists and writers, winemakers, and others. Even making it to the long list of nominees is cause for celebration, adding to the prestige of restaurants and serving as an undeniable gold star on a chef’s resume. The food media often spotlights nominees when they’re announced, providing free publicity that can translate to increased business and savvier patrons. Thus, the competition to get even this far is intense: this year, the semifinalists for the 21 categories within the Restaurant & Chef Awards were reportedly whittled down from 20,000 online nominations. Today, March 15, the Foundation announced the finalists for awards such as Best New Restaurant, Outstanding Pastry Chef, and Outstanding Chef, as well as for a slew a regionally specific chef awards. In the years since I entered the restaurant world, I’ve had the same conversation with coworkers and peers around this time about our impressions of the James Beard Awards. From my perspective, the nominees have always seemed fairly homogenous—that is to say, white and male. My coworkers in the kitchen noticed the same thing. But I never took the time to confirm if my suspicions were based in a quantifiable reality or just a hunch. There’s no question that most of the hard-working chefs and talented industry professionals on the lists of nominees have earned their accolades. At the same time, I can’t help quelling what I admit is a gut reaction, as a woman of color in the industry: a feeling like I’ve mistakenly entered the wrong room. Inspired by a Twitter conversation between food writer Korsha Wilson and @shitfoodblogger and Eater editor Helen Rosner’s recent article on gender representation in the Restaurant & Chef Awards, I crunched the numbers on the JBFA’s list of nominees. As reported by Rosner, among the individual semifinalists for the Foundation’s 2016 Restaurant & Chef Awards, 257 are men and 84 are women. So that makes for 24.6 percent women represented overall. The percentage of nominees who are women would be 18.1 percent if not for the two separate categories for bakers and pastry chefs. According to data from the Bureau of Labor Statistics for 2015, 19.6 percent of the 415,000 chefs and head cooks in the United States are women. If you fold in the data for “bakers,” the percent of women in the industry goes up to 34.3 percent. It’s worth noting that the food service industry as a whole is 54.5 percent women; that includes line cooks, bartenders, dishwashers, servers, and so on. While the majority of people employed in the industry are women, the numbers show that the most esteemed and “creative” positions are, more often than not, occupied by men. It’s not for lack of interest, either: Last year, Eater NY restaurant critic Ryan Sutton reported in Bloomberg, “Women have made up over 40 percent of the International Culinary Center’s classic (i.e. non-pastry) graduates for the past decade. At the Culinary Institute of America in Hyde Park, female enrollment in the culinary arts associates program has risen from 28 percent in 2003 to as high as 35 percent in 2012.” And yet, he found that women were sparse, if not non-existent, in kitchen leadership positions within America’s top restaurant groups. 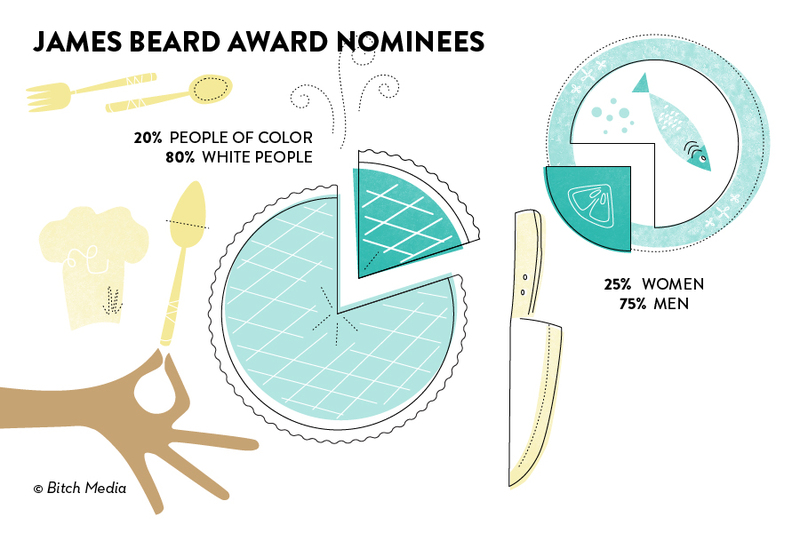 The James Beard Awards reflect that disparity industry-wide. In 2014, Eater published a detailed gender breakdown of JBFA nominees and winners by year, showing a gradual uptick in the proportion of women being recognized. This likely is owed to the fact that the JBFA has done a great job of reaching gender parity within its awards committees, who select the semifinalists from the nomination pool. This year, women are the majority (9 out of 17 members) of the Restaurant & Chef committee, which is mainly made up of food writers and editors. The greater food industry has a long way to go as far as reaching gender parity, but, perhaps owing to the burgeoning input of outspoken food writers and chefs like Anita Lo (chef/owner of Annisa); Amanda Cohen (chef/owner of Dirt Candy); Hillary Dixler, Paula Forbes, and Helen Rosner (Eater); and Kat Kinsman (Tasting Table), conversations about unequal press coverage, maternity leave issues, disparate pay, and misogyny in the restaurant kitchen have already made their way into mainstream publications. Going down the list, I found that about 79 percent of the JBFA Restaurant & Chef semifinalists are white (non-Hispanic, non-Latinx), 11 percent are Asian-Pacific Islanders, five percent were Hispanic or Latinx, two percent are Middle Eastern-North African, and one percent are Black Americans. I gathered the data on race by cross-referencing press releases, interviews, bios, and other information. Cases where the individual did not disclose their race or ethnicity went into the “Other” category, which turned out to be two percent of the nominees. 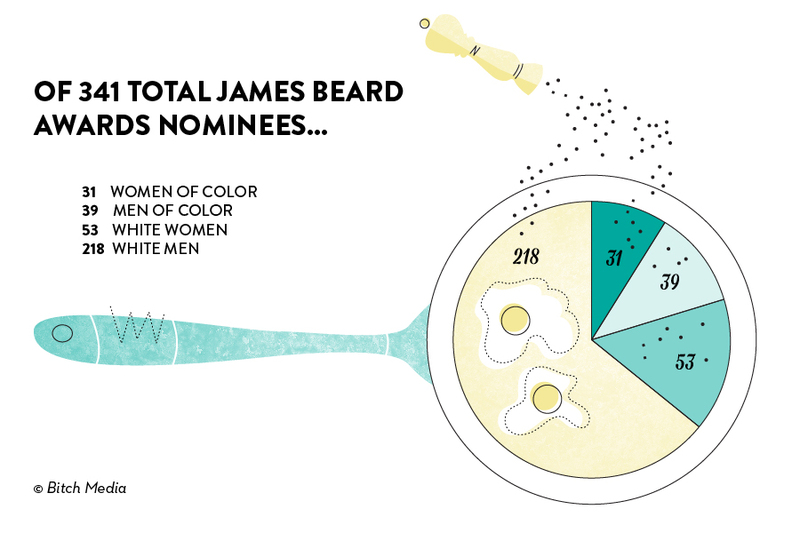 While numerous food media outlets have done great reporting on issues around gender in the kitchen, the question of racial representation in the JBFA has remained largely unadressed. How can there be such a disconnect between the demographics of the individual nominees and the industry at large when the JBF’s stated mission is the “celebrate, nurture, and honor America’s diverse culinary heritage”? Surely it’s not due to a lack of diversity within the industry itself, as the data from the Bureau of Labor & Statistics shows. In fact, organizations like the National Restaurant Association openly tout the industry’s employment of numerous women and people of color as a strength. 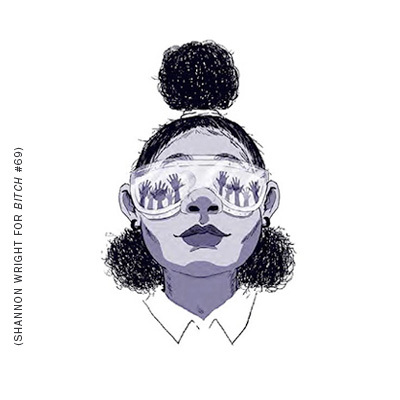 Rather, the difference lies in entrenched racial and gender discrimination that keeps minority workers in the lowest paid and least-recognized tiers of the restaurant industry. Last year, the Restaurant Opportunities Centers United (ROC) published a study of the ways in which workers of color and women have been excluded from the most visible sectors of the restaurant industry. The research study, provocatively titled, “Ending Jim Crow in America’s Restaurants: Racial and Gender Occupational Segregation in the Restaurant Industry,” credits a wide mix of structural as well as implicit biases for the lack of upward mobility for minority workers, who are often shuttled into lower paying positions while white men are awarded with more prominent ones. These barriers include the lack of affordable childcare for working class parents, a lack of diversity among industry gatekeepers, limited training for fine dining service interactions, closed-network job postings, and a general unwillingness among restaurant owners to discuss racial issues in their staffing. Despite (or even because of) the latter, much of the problem lies in implicit discrimination: an unspoken or coded system of determining who belongs where. Hiring managers can use code words like “clean-cut,” “greasy,” “articulate,” or “communicative” to sort candidates along racialized criteria without being subject to charges of racism. 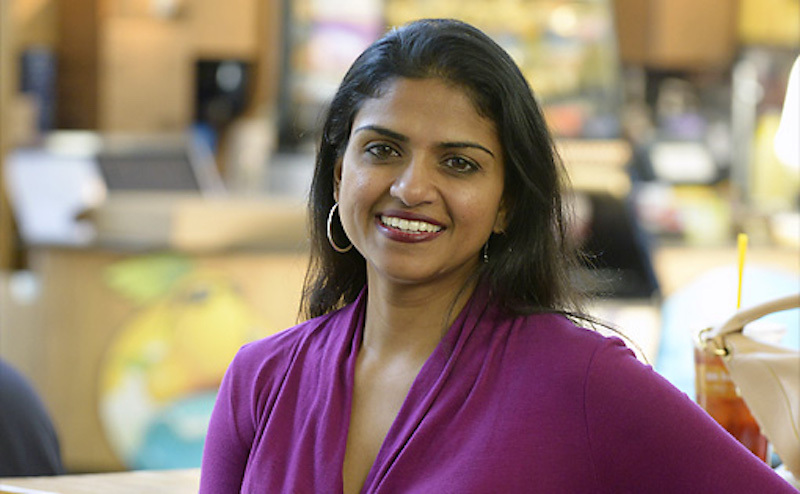 Restaurant worker advocate Saru Jayaraman. Photo courtesy of ROC. It seems strange that the JBFA would honor a restaurant labor activist like Jayaraman for her work while perpetuating a cycle of homogeneity in their chef awards. In fact, applying the Restaurant Opportunity Center’s findings to the practices and voting procedures of the JBFA might actually help identify its problem of representation and recognition of industry minorities. For example, as shown earlier, the demographic makeup of the gatekeepers—in this case, the Restaurant & Chef Awards committee—can go a long way in determining which nominees make the cut into the nominees. But the problem with stacking a committee with food writers is that racial and class diversity within food writing and editing is miniscule. Though the JBFA has taken measures to makes the committee regionally diverse, the sweeping majority of committee members are white. Additionally, as chef Mario Batali told The New York Times, the finalist voting process that takes place after the long list of nominees is released “results in little more than a popularity contest.” Though he made these remarks in 2004, this part of the process has not changed much since then. Once announced, the ballot is distributed online to a voting body of over 300 previous James Beard Restaurant & Chef Award winners, 250 panelists divided evenly among 10 regions, and 17 members of the Restaurant and Chef Award subcommittee. Eating at the nominees’ restaurants is not a stated requirement to voting for this final round, much like how viewing all of the nominated films is not a requirement for voting in the Academy Awards. And with more than 300 semifinalists, it would be physically impossible to do so in the month before votes are due to be cast. It’s a catch-22: Voters have to rely on press coverage to fill in the gaps of their knowledge. But generally the chefs and restaurants who get awards also get the most publicity, so the cycle of hype and awards is self-perpetuating. In addition, having more than half of the voters be previous award winners in a pool that has historically included a vast majority of white men dilutes any sort of intentional diversity. Like the process of restaurant owners casting for new employees within their current employees’ social networks, the JBFA’s voting process leaves plenty of room for demographic self-replication, even when it is informed by the best of intentions. “Restaurants engage in a lot of strategies to attract the press. They host special dinners, they hire expensive publicists, they lobby to be invited to the 'right' industry events where they can meet journalists. Getting into that world takes a big commitment of time and money, and because female chefs get less coverage, they attract fewer investors, and they may not have the resources to gain entry. As a highly influential tastemaker in the American culinary scene, the JBFA plays a large part in deciding the literal Who’s Who every year. We’ve seen in recent years that the JBFA is more than capable of changing its practices to be more inclusive, and in so doing, improve the visibility of people who often get stuck in the underbelly of “America’s diverse culinary heritage.” This year, the JBFA’s galas will be hosted by two people of color: chefs Carla Hall and Ming Tsai. Hopefully next year, we will see more people of color on that stage who aren’t just there as the entertainment. Personal stories of people who grew up as first-generation Americans and Canadians.